Buddhism in Cambodia dates back to at least the 5th century A.D. Jayavarman of Fu-nan, Suryvarman I and Jayavarman VII were Buddhists. 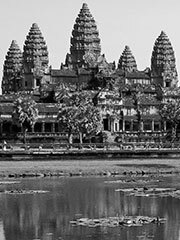 Up to the 13th century, Cambodia was primarily influenced by Mahayana Buddhism and Saivism. After the 13th century Theravada Buddhism became the main religion of Cambodia. Thearavada Buddhism is the official religion in Cambodia which is practiced by 95 percent of the population— just like that of Thailand, Burma, Sri Lanka. However, Christianity and Cham Muslim are being active and popular among a large number of population as well in the capital and provinces, showing a sign of growth. Sitting cross-legged with one hand lain atop the other with palms facing upwards. «Vitkak» means contemplating or concentrating. This is a classical depiction of the Buddha during meditation and is one of the more familiar stances. This depiction relays the path of the Buddha, as he strove to understand and eventually alleviate, the suffering of all living things. Sitting cross-legged with the right hand turned palm inwards and the fingers pointing to the earth, the left palm resting on the thigh. This is also known as «calling the earth to witness.» This comes from the story of Buddha, as he sat underneath the Boddhi tree. As it neared dawn Mara came in the form of temptation and demons to disturb the Buddha. In retaliation the Buddha touched the earth and invoked its power thus dispelling the evil forces. symbol of the wheel is a classic Buddhist imagery and can be seen as representing the wheel of life and the eternal cycle of Samsara — the repetition of death and rebirth to which all humans are victims to. Either standing up, or sitting cross-legged with a raised right palm — as if stopping someone in front — the left hand points down parallel to the body. «Akpheay» means fearlessness. Buddha is seen as praying to help the world’s animals. In this stance it is a reminder of an important tenet of Buddhism- to not harm sentient creatures. Putting down both the right and left hands at his side with both palms facing the front, he sometimes sits cross-legged or stands up. This depiction is to ensure those who pray to the Buddha also receive his protection. In this sense it can be seen as a blessing stance. Standing clasping his Bat (Buddhist’s alms bowl). Historically Buddha collected alms and this is still a crucial part of the contemporary Sangha (monastic community) — even today they can be seen on the street collecting offerings of food from the faithful. When the Buddha eventually died, he is reputed to have turned his alms bowl upside down. Even to this day an upturned bowl in many Buddhist countries can signify death. Reclining, the Buddha sleeps by turning his body to right side and left leg put over right one. This shows his entrance to nirvana; the point at which he left his physical body. Ironically this stance is often seen as the most serene. Usually this refers to the moment when Buddha died and left the cycle of Samsara. The idea of death being as natural as sleep is one that is conveyed. It also shows his fearlessness due to the compassionate and benevolent smile that is normally associated with this gesture. «Neak» means dragon and «Brak» means to cover something. This relates to a story of when there was a heavy storm and a dragon, more often translated as a Naga, came to shelter him. Thus the Buddha is depicted as sitting cross-legged underneath a multiple-headed, hooded serpent that is coiled beneath him and thus protects him. While the statues themselves cannot speak, the body language is positively verbose. From the tiniest detail comes a story or parable that aims to help humanity on the path to enlightenment. With such a diverse amount of Buddhist schools and followers, there is an equally large amount of differing representations. The important role religion plays within the kingdom is obvious. Within each pagoda, there are depiction of Buddha. Thus it is important to be able to tell the differing gestures apart, to try to comprehend the diversity of the religion. It is across the void of time that the artisans, who created these pieces, speak about this journey and the hope that all humans can actively bring about the cessation of suffering.